At her go-ahead, she will have an intricate network of financial donors (built up over three decades of Clinton politicking), experienced and enthusiastic campaign operatives (including alumni of both of President Barack Obama’s successful campaigns) and endorsements from an array of Senators, Congressional representatives and political action committees at all levels of relevance for a 2016 campaign. Coupled with her immense leads in early polling of the 2016 Democratic primary electorate – she currently commands the support of approximately 60% of potential primary voters and leads of 40%-50% over her nearest Democratic rivals – it seems as though her path the nomination is a walk in the park. Recently, however, Clinton has made comments that have resurfaced lingering concerns about the Clinton machine and their capacity to connect with middle and working-class voters likely to be essential to any electoral success in 2016. Despite earning upwards of $100 million since leaving The White House, in an interview with ABC’s Diane Sawyer, Clinton said: “We came out of the White House not only dead broke but in debt. We had no money when we got there, and we struggled to piece together the resources for mortgages for houses, for Chelsea’s education. You know, it was not easy.” In an era of Occupy Wall Street and in the aftermath of Mitt Romney’s failed candidacy for President in 2012 (hampered in part by backlash to the way he acquired and articulated his immense wealth), many suggest that such a mindset will not be effective at securing the necessary votes for Clinton to claim the Democratic nomination and go on to win the Presidency. One figure who has sought to position himself in contrast to Clinton’s comments is Vice President Joe Biden, who, in a subtle swipe at his potential 2016 contender, stated that, as the poorest man serving in Congress before his election in 2008, he didn’t own stocks, bonds or even held a savings account (later retracted). Biden’s musings at a potential candidacy in 2016 have been noted ever since Obama’s re-election in 2012. During the festivities for Obama’s Second Inauguration, it was noted that Biden was engaging heavily with Democratic committees and activists from key primary states, such as Iowa and South Carolina. 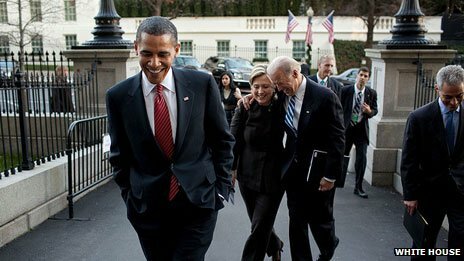 Despite the seeming pre-eminence of establishment candidates such as Clinton and Biden to succeed the ultimate outsider, Obama, in 2016, is there scope for an Obama-esque figure to rock the political world once more and win the nomination to take on the as yet, unknown Republican nominee? Harry Enten of FiveThirtyEight ran the numbers to see if there was such a candidate, who a) was open to running for the nomination, and b) could carve out a niche in the Democratic primary electorate strong enough to challenge Clinton. Running the numbers on the extensive polling conducted (despite being years away from actual voting in the early primary states), Enten notes that Clinton performs worse amongst men than women and better amongst self-identified liberals than moderate and conservative Democratic voters. When put together, Enten concludes that a potential anti-Clinton candidate that could have success would likely be male, moderate and anti-establishment. Such names that fit this profile are the likes of Jim Webb (former Virginia Senator) and Brian Schweitzer (former Montana Governor). Schweitzer in particular looms as a candidate to watch. He was very popular as Governor in Montana, a solidly Republican-leaning state, is prepared to criticise President Obama, and isn’t a fan of the establishment that Clinton embodies. The analysis doesn’t bode well for the likes of Biden, or potential challengers from the left, of note being recently elected Senator from Massachusetts and activists against the excesses of Wall Street, Elizabeth Warren. Perhaps these comments may create an opening for the likes of Warren, well known for her passionate, populist advocacy for stricter regulations on the financial industry, but with the polling in mind, it will likely take more than a few slip-ups from Clinton to fundamentally reshape the 2016 Democratic primary. Provided she can connect with regular voters, one has to assume that 2016 is Hillary’s to lose. You can follow Christopher Weinberg on Twitter @CRJWeinberg. This entry was posted in 2012 Presidential Election, 2016 Presidential Election, American Politics, Barack Obama, Bill Clinton, Elections, Elizabeth Warren, Hillary Clinton, Joe Biden, The Melbourne Globalist by christopherweinberg. Bookmark the permalink. You should add an email subscription to your blog – enjoying the reads, Chris!